I'm going to do my damnedest to make this my check in day. Through my weight loss progress so far I got pretty lazy. When you are as big as I was making little changes and eating less will allow you to lose a good amount of weight and you don't have to worry about tracking calories or points or whatever it is for whatever system you are doing. That's what I did. I just adjusted a little here and there and lost weight consistently and didn't worry about it. 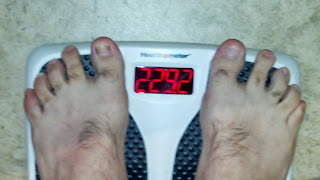 Then I got down to about 235 and it all just sort of stopped. I stayed there for nearly 3 months until I decided that I needed to do something about it. I'm currently using MyFitnessPal and tracking my daily calories and making a really big effort to go near or stay under my goal every day. I've changed up what I have been eating and made adjustments after looking at the caloric information of all the foods I was putting in my system and am currently working on getting this new routine down for what I'll be eating. Greek Yogurt has been the MVP so far as it's loaded with protein and low calories. I'm throwing in a decent amount of chicken and turkey and all is right with the world. This past week while my weight loss kicked back into high gear I lost about 5 pounds and before anyone tells me that losing 5 pounds in a week is generally unhealthy I'll point out that it happens once in a while. Over the course of the year plus that I have been changing the way I eat I have had a few weeks where I have lost 5 pounds and a few weeks where I have gained 5 pounds. However, they are not the norm as it's usually just a pound or two here and there. Either way - I finally broke a plateau that I've been looking forward to for quite a while now and that is getting under 230. I cannot remember the last time I was under 230 - It had to be back during my college years, my early college years, and we are talking over a decade at this point. So, here's to getting to that next mark of 220 (which was my initial weight loss goal when I first set out on this journey) which I'm hoping comes around the end of July! When I first started I was over 300 pounds. I first noticed around March of 2012 and that is when I decided enough was enough. 1 year and 3 months later - over 70 pounds lost and still another 30-50 to go! Congrats! Through helping The Wife try and lose weight, I appreciate what a struggle it is and what an achievement it is when you reach your goals. It's so easy to put it on but takes a lot of dedication and patience to take it off. However, my struggle has been all about choices and trying to make the right ones which I am currently doing. Er, at least making better choices. you, sir, are an inspiration. started my own weight loss quest shortly after i read one of your blog entries. started at 285 now down (and stuck) to around 250. While you may be temporarily stuck at 250 - Just keep a positive attitude about it and remember that you've already shed 35 pounds. Load up a backpack with 35 pounds worth of food and walk around with it all day and remember that you used to do that every day of your life. Thank you for the kind words and hope you keep reading!